Nearly extinct after WWII, the American Bulldog was saved by the efforts of one man named John D. Johnson. Originally used for the blood sport of bull baiting, this breed became prized by farmers for their intelligence, working abilities, stamina, and protective nature. 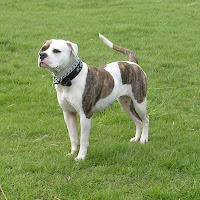 American Bulldogs were also used to hunt wild boar, bear, raccoon, and squirrel. Considered to be a rare breed, the American Bulldog is ranked number one for their versatile capabilities.